The fast f/2 maximum aperture makes it a versatile prime lens for low-light photography. The 35mm focal length facilitates a field of view akin to human vision (excluding peripheral vision), which makes it a nice focal length for capturing scenes with natural perspective; and it’s a popular choice for photographers shooting events, weddings, or environmental portraiture, as well as interiors and architectural photography (if you can get far enough back). 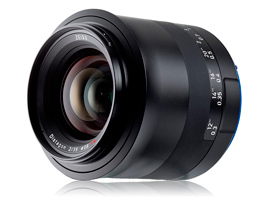 The Milvus 35mm f/2’s aperture range runs between f/2 and f/22, with a minimum focus distance of 30cm. Optical construction utilizes 9 elements in 7 groups; the lens measures 83mm in length, weighs 702g, and has a 58mm screw thread for attaching filters. As mentioned, there’s no autofocus, nor image stabilization, but the Milvus range electronically couples with your DSLR to record lens data to the EXIF file. The Milvus 35mm f/2 is also compatible with Canon APS-C sensor DSLRs, such as the EOS 7D Mark II, on which it offers an equivalent 56mm focal length, which is still useful for general-use photography. 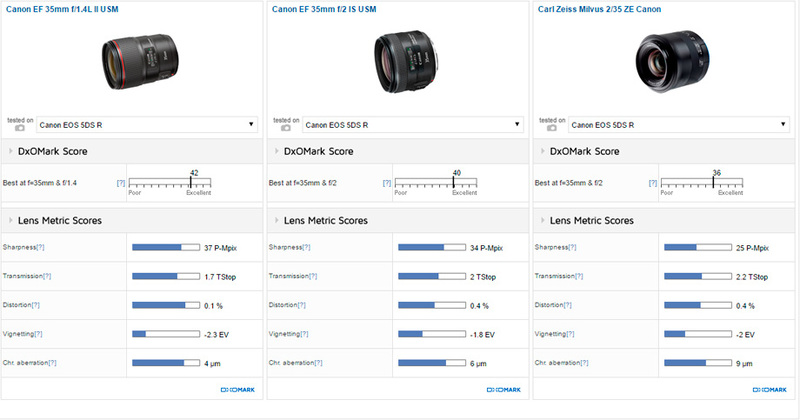 Good low-light performance helps it achieve an overall DxOMark score of 36 points tested on the EOS 5DS R, which puts the Milvus 35mm f/2 in 6th place for 35mm primes behind all iterations of the own-brand Canon EF 35mm, the Sigma 35mm f/1.5 A, and the Carl Zeiss Distagon T 35mm f/2 ZE. Its highest overall sharpness score of 25 P-Mpix achieved on the 50.6Mp 5DS R is good, but the Milvus 35mm f/2 realizes more of the sensor potential on lower-resolution chips, such as the 30.4Mp EOS 5D Mark IV, on which it scores 22 P-Mpix, and 17 P-Mpix on the 20.2Mp 1D X Mark II. It achieves peak sharpness of around 80% acutance in the center of the field using aperture settings between f/2.8 and f/8. Resolution at the maximum f/2 aperture is good at just over 70% acutance in the center of the frame, dropping to around 65% in the outer field. Although sharpness isn’t truly uniform at any aperture, there’s only a modest drop-off towards the edges of the frame, so it’s still good in the corners. There’s a little barrel curvature of 0.4%, which isn’t surprising for a slightly wide-angle lens, but it’s well-controlled and doesn’t require much post-production correction. Some fairly heavy vignetting (–2EV) occurs using the maximum f/2 aperture, which improves significantly to –1EV at f/2.8; and although the lens is not completely free from corner shading between f/4 and f/22, it’s significantly better, with only –0.33EV corner shading evident at these settings. The Milvus 35mm f/2 also handles chromatic aberration well, with only some minor fringing in the far corners using the wider aperture settings up to f/2.8; and although some very mild fringing is evident towards the outer field between f/4 and f/22, it’s not overly concerning. Head-to-head against the $1649 Canon 35mm f/1.4L II and the $549 Canon 35mm f/2 IS USM, the own-brand equivalents come out on top for almost all lens metrics. Improved light transmission and low-light performance results in higher overall DxOMark scores of 42 points for the EF 35mm f/1.4L II, and 40 points for the EF 35mm f/2. Resolution at f/2 is sharpest using the more expensive EF 35mm f/1.4L II, which achieves around 80% acutance in the center of the frame, compared to around 70% acutance for the EF 35mm f/2 and the Milvus 35mm f/2 equivalents. Using mid-range apertures between f/2.8 and f/8, all three lenses are very sharp in the center of the frame, but the EF 35mm f/1.4L II again comes out just on top, with slightly more uniform resolution at the far edges compared to the cheaper competition. 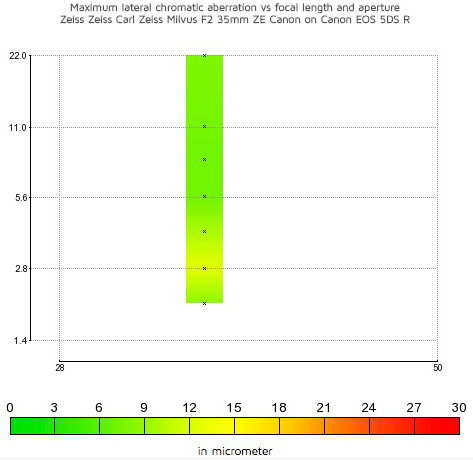 Overall lens metrics for distortion, vignetting, and chromatic aberration are fairly similar between the Milvus 35mm f/2 and the EF 35mm f/2. The EF 35mm f/1.4L II offers a notable improvement for distortion and fringing, though, with almost perfectly straight lines and a distortion score of just 0.1%, along with well-controlled fringing of just 4mm. 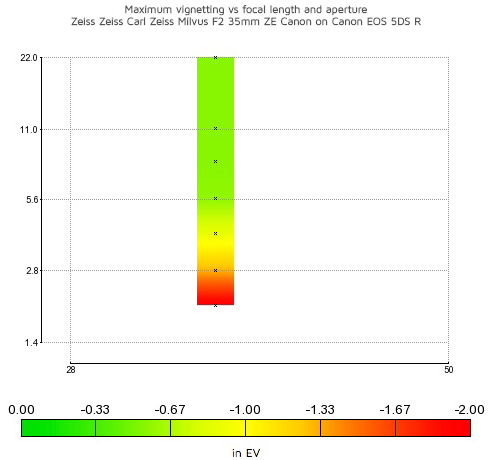 Fairly heavy vignetting of –2.3EV occurs on the EF 35mm f/1.4L II at the maximum aperture, but close down a stop to f/2 and corner shading on Canon’s flagship 35mm improves considerably, outperforming the cheaper 35mm f/2 alternatives at the same setting. 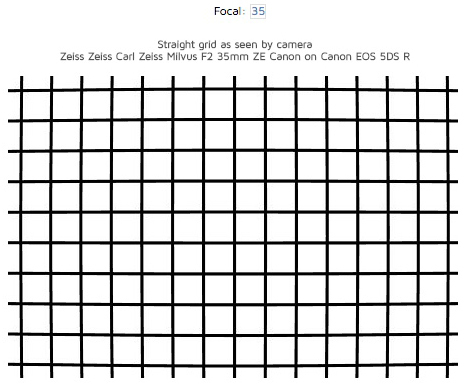 All scores between the Milvus 35mm f/2 and the now discounted and slightly cheaper Carl Zeiss Distagon T 35mm f/2 ZE alternative are remarkably similar across the board. Now available for $799 from B&H, the Distagon T version represents good value, with similar levels of performance to the newer Milvus option. Although it boasts a robust solid construction, it doesn’t quite have the same modern feel and design as Zeiss’s latest Milvus design. The Sigma 35mm f/1.4 A remains one of the top-performing third-party lenses we’ve tested and compares very favorably to the Milvus 35mm f/2, notably for low-light performance and sharpness. 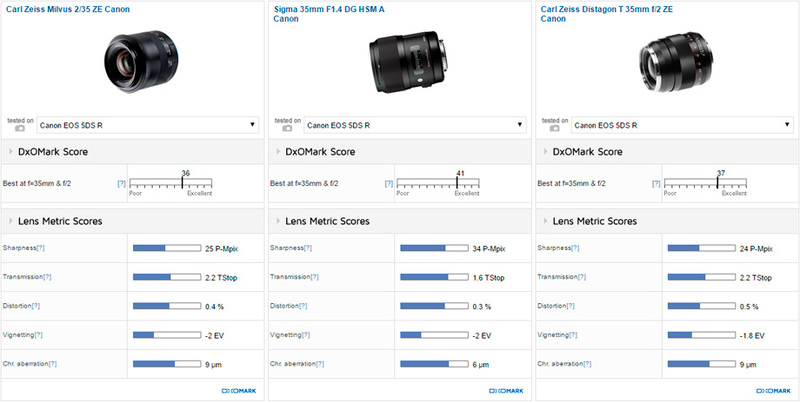 With excellent 1.6 T-stop light transmission, the Sigma lens achieves an outstanding overall DxOMark score of 41 points, compared to 36 for the Milvus, along with a significantly higher sharpness score of 34 P-Mpix that maximizes more of the EOS 5DS R 50.6Mp sensor’s resolution potential. 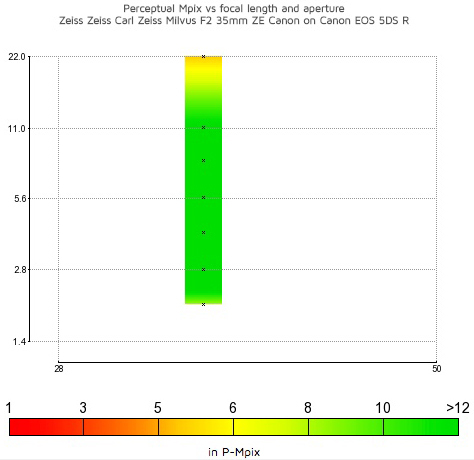 The Sigma resolves better sharpness at f/2 in the center of the frame compared to the Zeiss competition at the same aperture; and although there’s a little edge drop-off on the Sigma, it’s no worse in the corners. The Sigma 35mm f/1.4 A delivers peak sharpness between f/2.8 and f/8, where it offers high levels of uniform resolution of over 80% acutance in the field. The Milvus alternatives aren’t bad at these settings either, but don’t quite hit the same high levels of sharpness in the center of the frame, with noticeably a little more drop-off, too. With an irreproachable reputation for quality, Carl Zeiss lenses have long been the desire of many a photographer. Historically they’ve often been out of financial reach for many of us, unfortunately, but the new Milvus range looks to address that with some competitively-priced models to challenge the high performance optics from both own-brand and third-party manufacturers. Featuring an all-metal construction, manual focus, and Zeiss precision engineering, the Milvus 35mm f/2 is the type of lens that should last a photographer a lifetime. The performance of the ZE (EF-mount) Canon version is very good, with nice low-light results and high levels of sharpness, particularly in the center of the frame. The Milvus 35mm f/2 realizes more of the sensor potential of the lower-resolution chips in the EOS 5D Mark IV and the 1D X Mark II compared to the EOS 5DS R. It does achieve its highest overall sharpness score of 25 P-Mpix on EOS 5DS R, but this represents only half of the camera’s 50.6Mp sensor resolution. Compared to Canon’s original EF 35mm f/1.4L and the alternative Zeiss Distagon T 35mm f/2 ZE, the Milvus delivers very comparable results across the board. However, the Milvus doesn’t quite match the heights for low-light performance and sharpness compared to the Canon EF 35mm f/1.4L II or Sigma’s 35mm f/1.4 A, which boast autofocus, too. This said, if you want some first-class German engineering to attach on the front of your Canon DSLR, the Carl Zeiss Milvus 35mm f/2 is a beautiful lens and delivers good results. For greater insight into the performance of alternatives to the Carl Zeiss Milvus 35mm f/2, please see our EOS 5DS R and EOS 5D Mark IV best lenses reviews, as well as our Canon EF 35mm f/1.4L II lens review.